Choosing Tile for Your Bathroom? Read This. 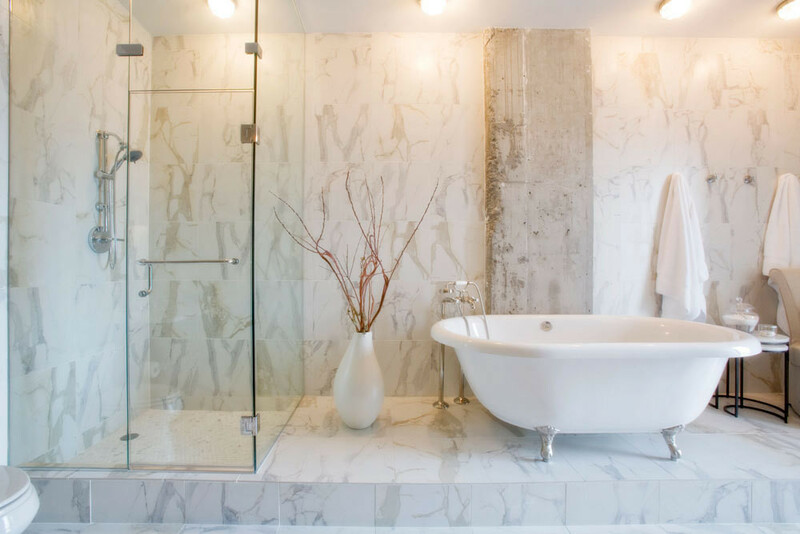 The master bath in Gwyneth Paltrow's Nashville condo, decorated by Annette Joseph in Calacatta Porcelain. Imagine white marble mountains tumbling into the ocean.” Mary Elizabeth Oropeza is rhapsodizing about the destination that led to her choice of career. 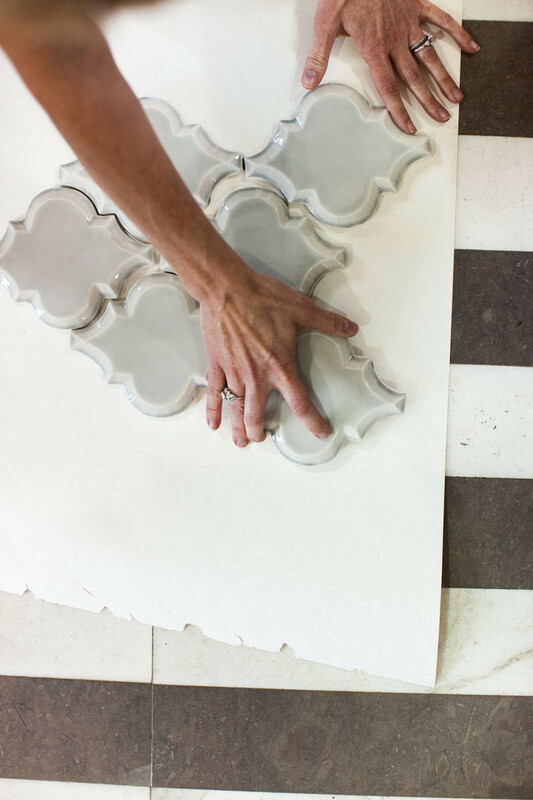 “[My] trips to Italy to learn about marble in its raw state—and how it transpires from a mountain to a piece of polished luxury tile in your bathroom—were pretty inspiring.” As founder of Mission Stone & Tile, a Nashville-based retailer that sells its luxury products nationwide at affordable prices, Oropeza is helping transform tile’s hardworking image into something with serious cult status. Mission Stone & Tile founder Mary Elizabeth Oropeza. A background as an interior designer gave Oropeza additional insight into how her clients are thinking about tile for their homes. “Customers these days are savvy—they’ll bring in a photo from Lonny or Houzz, and our job is to recreate it affordably,” she says. “You can texturize your space in the least likely places. Right now we’re using a lot from our Essentials collection, which is a twist on subway tile. It’s a timeless option for kitchen backsplashes and bathrooms that provides something a little different.” With projects that range from the speed-round remodel of Gwyneth Paltrow’s Nashville loft to DIY backsplashes in her own home, Oropeza has experience with all kinds of budgets and styles. Her primary advice: “Choose materials that reflect your lifestyle. Are you low-maintenance? Do you have kids or pets? 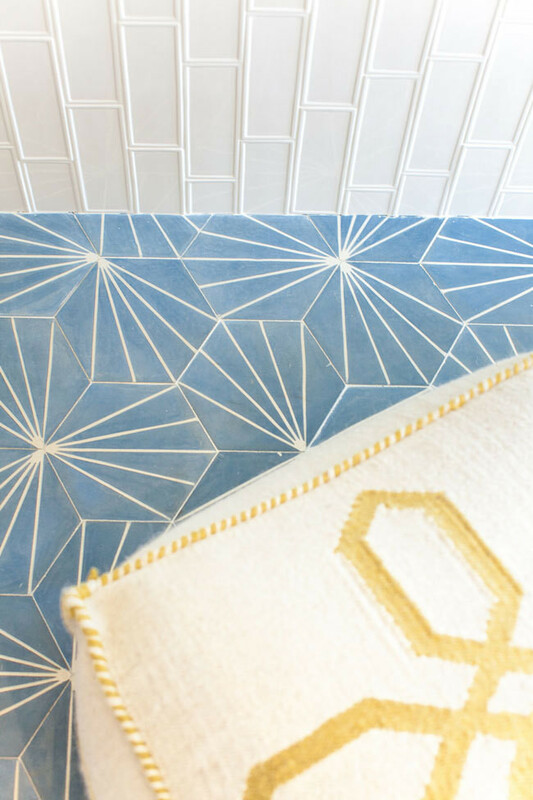 Do you entertain?” Here, her tips on choosing bathroom tile, with lessons from four very different spaces. Ten days. That’s how long interior designer Annette Joseph had to renovate a raw loft in downtown Nashville into a family-friendly temporary home for Gwyneth Paltrow and her children. “We needed a dramatic yet affordable tile for the master bathroom—and it had to be available now,” recalls Oropeza of the project. Given the time constraints, Joseph concentrated her efforts on tearing down the bathroom walls to create a luxe open space. Floors, walls, and shower stall were covered in marble-like Calacatta Porcelain from Italy at a great price: $5 per square foot. The Nashville location of Mission Stone & Tile. 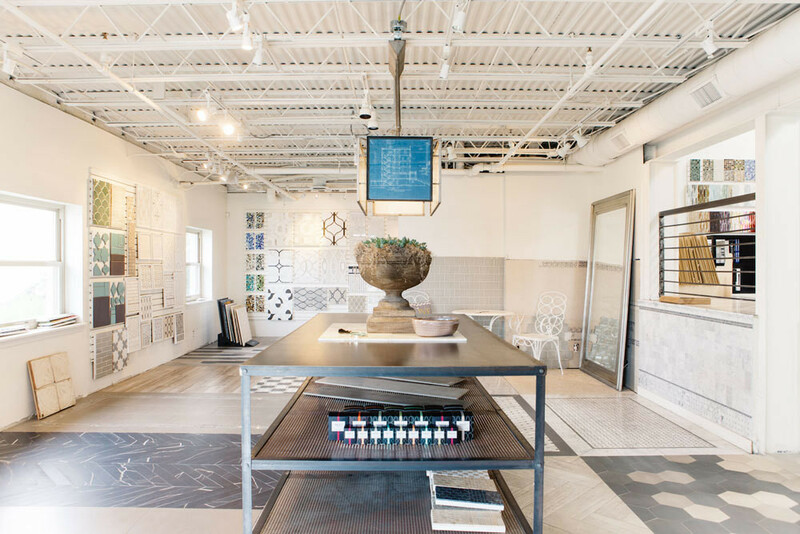 Mission Stone & Tile’s Nashville showroom elicits a kid-in-a-candy-store feeling. Samples, concept boards, and mock-installations share the space with decorative elements—a vintage dresser, an ornate mantel, a custom chandelier. “We tuck away our extensive selection of mosaics, accent tiles, and porcelain flooring so as not to overwhelm you with our abundance of options,” explains Oropeza. Look for the subtly textured PinStripe or HoneyComb to take subway tile to the next level. Dandelion cement hexagon tile in the showroom. An arabesque wall tile in action. 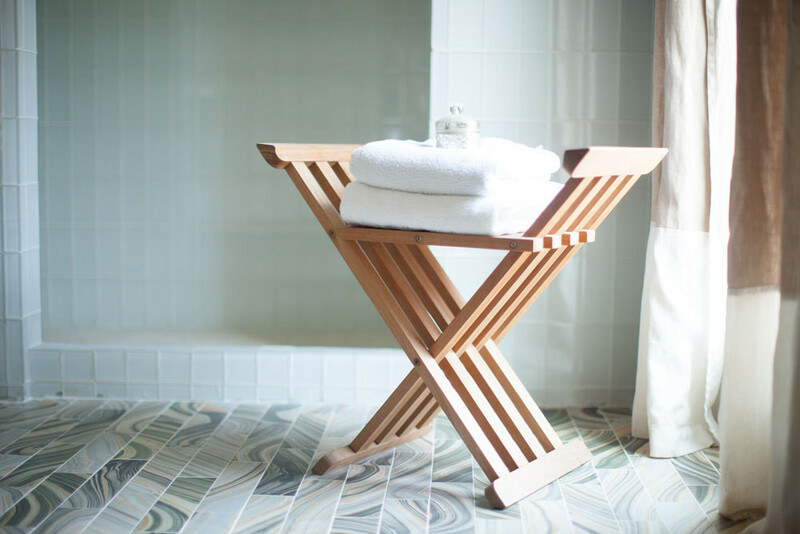 In Oropeza’s own home, located in Nashville’s stylish 12South neighborhood, a 3x12 porcelain tile called Malachite Esker takes pride of place in a space highly frequented by guests: the poolhouse. “I chose it because of its story—it’s made in the U.S. using 50 percent recycled glass from fluorescent light bulbs,” says Oropeza. “Plus it’s durable, lightweight, and sound-dampening, and suitable for both interior and exterior walls and floors.” With its eye-catching marbleized pattern, it’s a great way to try out a trend underfoot. Mission Stone & Tile's 3x12 Malachite Esker in Oropeza's pool bath. “As a tile designer, it was important to me to use something timeless that I wouldn’t tire of—and that was a white glass tile,” says Oropeza. For her master bath, she chose Vetro Neutra Bianco Lux, which provides a subtle sheen and a classic backdrop for the spa-like space. 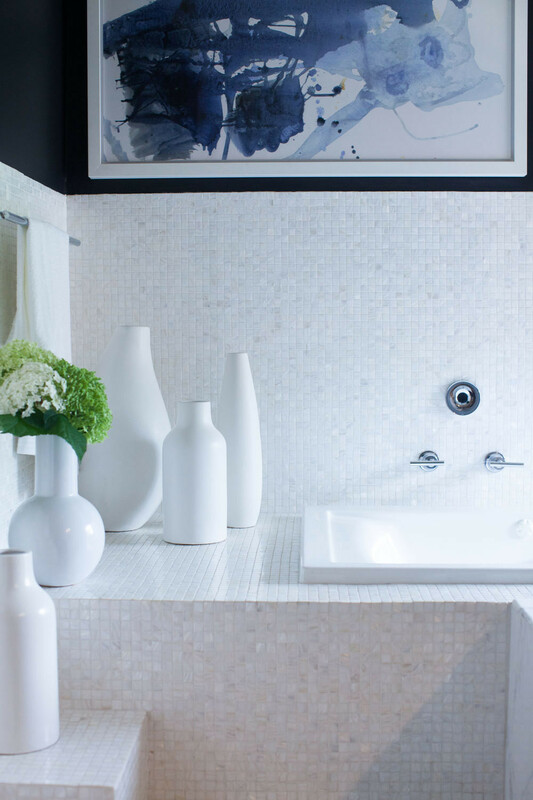 Oropeza's master bath features Vetro Neutra Bianco Lux mosaic glass tile.